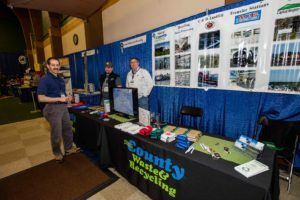 The Federation Conference and Trade Show brings together the leaders of the Empire State’s solid waste & recycling industries. Exhibiting in the Trade Show provides a direct link to top-level executives and a forum to meet existing clients and customers. Exhibitors representing equipment manufacturers, engineering, finance and legal consultants, associations, government agencies and environmental groups will reach public and private sector decision-makers from New York and the Northeast at the Trade Show with their products and services. Conversation tables are located throughout the Main Exhibit Hall. Booths are assigned on a first-come, first-served basis. Prime locations sell out quickly. Additional booth personnel daily (meals only) rates are available. Hale Northeastern, Inc. has been designated the offical decorator. The Exhibitor Services Manual, including important shipping information, can be requested from Hale Northeastern, Inc. at (716) 896-6170. Tuesday: 7:30 a.m. – 11:00 a.m.
Matthew Kemnitz, President, Leak Location Services, Inc.